Valentine’s Day can become an expensive holiday very quickly. Flowers, candy, cards… it all adds up! This year, add some fun new Valentine’s activities to your family traditions without breaking the bank! 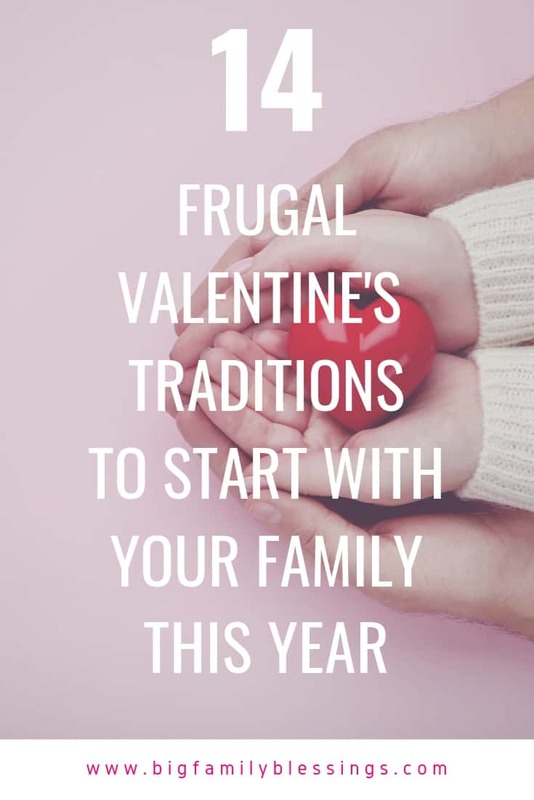 Here are 14 frugal Valentine’s traditions to start with your family this year. I am a fan of not getting overwhelmed, so I recommend choosing just a few of these fun, frugal, and family friendly Valentine’s Day activities, but you are welcome to try all 14 if that is the way you roll! Rather than spending money on store bought cards, encourage family members to write a letter (or a little note) to loved ones telling about the things you love most about that person. Use what you have on hand to create a pink breakfast on Valentine’s Day. Add a few drops of red food coloring to your morning milk. Use construction paper to create pink placemats. Cut more pieces of pink paper into heart shapes and scatter them around the table. Make cinnamon rolls with pink tinted icing. Spend the evening together, looking through old photo albums (or if you are like me, with little printed, gather around the computer to look through photos). Sugar cookie ingredients are pretty simple. Whip up some cookie dough, or use a roll of store bought dough, and cut out heart shaped cookies. Tint some frosting pink, round up any sprinkles or edible confetti you have leftover from parties and other holidays, and have a family sugar cookie decorating party. Show family members love by serving at dinner. This is a great way to allow children to show Mom their love in a meaningful way on Valentine’s Day. Reverse family rolls, members who usually plan, cook, serve, and clean up dinner get a break while others serve them for the day. Use Valentine’s Day as a day to show kindness to others. You can approach this day as a family, collectively choosing acts of kindness to complete together, such as taking out a neighbor’s trash or cleaning up their lawn, or sending cards to a local nursing home. Or, encourage family members to complete random acts of kindness within the home for other family members. Grab a stack of construction paper and cut out hearts of various sizes from several colors. Challenge your family members to use the hearts to see what fun heart creatures and animals each person can make. Family members can use glue, extra construction paper, and markers to add details to the creatures. Remember making acrostic poems in school? Write each family member’s name down a sheet of paper, then work together to describe that person using an acrostic poem. Set out a jar or box with a stack of scrap paper. In the days leading up to Valentine’s Day anonymously write notes about things you love about each family member. On Valentine’s Day read the notes aloud at dinner time. Hide hearts all over your house with clues and send your family on a fun scavenger hunt. On Valentine’s Day share the love stories of your family. You can tell how Mom & Dad met, or got engaged. If you know the stories of other family members, such as grandparents and great-grandparents tell those as well. You can even call family members to ask their stories. What a great way to pass the love of your family down through the generations! Spend quality time as a family on Valentine’s Day by having a family game night. Make it extra special by adding a special Valentine’s Day themed treat to the evening. Cuddling up with a movie is always a favorite way to spend an evening in our home. Valentine’s Day is another great excuse to have family movie night. Find a list of great Valentine’s Day movies and movie night ideas here. The easiest way to be frugal when celebrating Valentine’s Day is to use supplies you already have on hand. Gather art supplies and spend time as a family creating cards. The time spent together will be just as special as the cards you create! Valentine’s Day doesn’t have to be expensive! 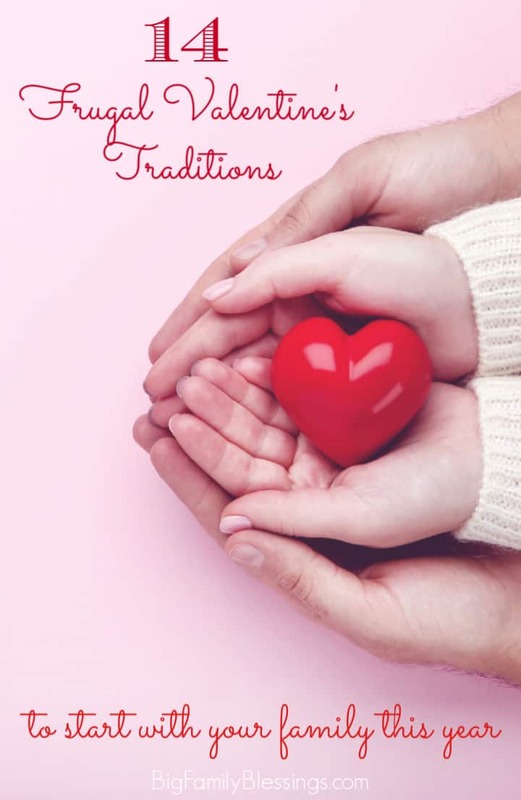 Choose one or several of these frugal Valentine’s traditions to start with your family this year!